Access 100 popular sessions from the 2018 Annual Meeting. The Virtual Meeting is an online product (also available with an optional USB, expected to ship in August 2018) that includes access to 100 recorded sessions from SNMMI's 2018 Annual Meeting. Optional USB also available for offline viewing. USB's expected to ship in August 2018. Access research presentations from the 2018 Annual Meeting. The Virtual Poster Hall is an online product that includes access to hundreds of Scientific Abstract Oral and Poster Presentations from SNMMI's 2018 Annual Meeting. Bookmark your favorite presentations for easy future access. Featuring up to 100 sessions from SNMMI’s 2018 Annual Meeting—you get anytime access to the latest research and techniques in the profession. Plus, the Virtual Meeting’s easy-to-use platform allows you to instantly view sessions from the meeting where and when it’s most convenient, including your desktop computer, laptop, iPad, iPhone, or Android mobile devices. TS18: PET 2.0: How the Experts practice Molecular Imaging in the 21st Century! Examine and evaluate future directions in nuclear medicine, molecular imaging and therapy from a research and clinical perspective. Review standard, new, and relevant advances in molecular imaging including applications in oncology, cardiology, and neurology. Examine important regulatory information, procedures, and guidelines for imaging. To receive CME credit, learners must view the presentations, achieve a score of 80% on the post-course assessment and complete the evaluation for each session by the expiration date listed below. Learners will have no more than 3 attempts to successfully complete the post-test. Release date: August 2018. Expiration date: August 2020. The target audience includes nuclear medicine and molecular imaging physicians, nuclear pharmacists and technologists. Disclosure information for specific sessions can be found in the front matter of each session. Disclosure of a relationship is not intended to suggest or to condone bias but is made to provide participants with information that might be of potential importance to their evaluation of the activity. Continuing Education Credit details for physicians, pharmacists and technologists are pending and will be released on September 1, 2018. Please note that not every session will offer CE Credit. How do I access the 2018 SNMMI Virtual Meeting or Virtual Poster Hall? Click here to access the Virtual Meeting. Use your 6-digit SNMMI user name and password to login. Click here to access the Virtual Poster Hall. If you forget your password, SNMMI.org allows you to reset your password. In this case, a new password is generated and sent to you to an email address provided. Reset password here. What is the Virtual Poster Hall? The SNMMI Virtual Poster Hall offers online viewing of scientific abstracts from the oral presentations AND the poster hall. This new product enables you to view an online version of the presentations given at the Annual Meeting. This opportunity enhances the value of being an abstract presenter, attendee and extends the life of the research presented and its availability to all SNMMI members, including those who were unable to attend the meeting. Rich content will be shown via ePosters, including audio and video. When can I begin claiming credits through the 2018 SNMMI Virtual Meeting? Credit claiming for the 2018 SNMMI Virtual Meeting will be available beginning on September 1, 2018. You will be able to claim credit through August 2020. How do the credits work if I attended the live meeting? If you attended the live meeting, you may only claim credits in the Virtual Meeting for those sessions that you did not attend at the live meeting. How many credits can I earn for watching the Virtual Meeting online? Up to 50 sessions will offer CE credit (CME, ACPE and VOICE). The total number of credits will be available in September 2018. Which sessions will have CE Credit through the Virtual Meeting? Please see the tab Available Sessions for the complete list. How do I claim CE credit for a session? Look for the CE button next to a session. After viewing the video, click on the Resources Tab, then click on the link to take you to the assessment. Why can't I see anything about CME, ACPE and VOICE on my mobile device or USB? You can claim credits using your computer or Apple or Android tablet, but not from the USB or mobile phone. Presentations can be viewed on the USB and mobile phone as well, but credit can only be claimed using a computer or supported tablet. Where can I find CME, ACPE and VOICE information and faculty disclosures? You can view CME, ACPE and VOICE information for an individual session, once you have viewed the video and clicked on the Resource Tab to link to begin taking the assessment for CE credit. Where can I get my CE certificate? Your certificate will be accessible via the SNMMI Learning Center where you will complete your evaluations and be able to print your certificate. How do I pass the assessment after viewing the session presentations? You are required to pass the assessment with a score of at least 80% to earn credit. You have three attempts to pass the assessment. How do I find a specific presentation? You can search for presentations by session title, lecture title, or speaker name by using the search box on the top of the page. 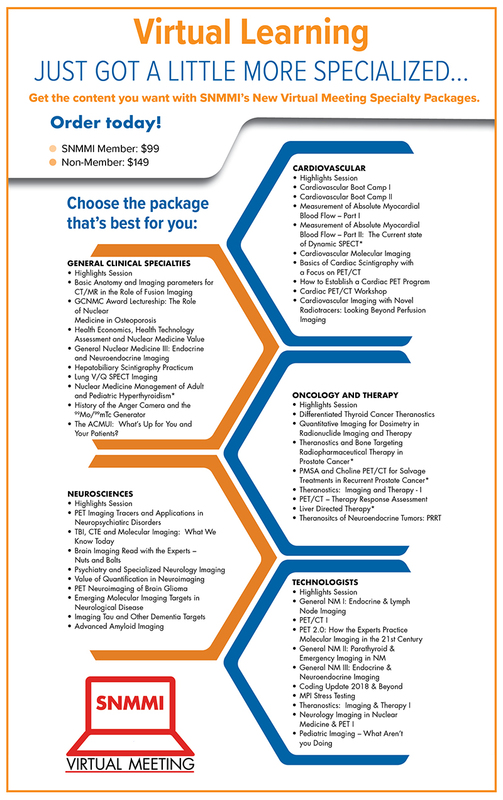 Oncology and Therapy Bundle - 50% off through March 31 in honor of World Theranostics Day! Questions Regarding the 2018 Virtual Meeting or Virtual Poster Hall?